This is not how the dream was supposed to play out for either team. The BYU Cougars boldly went independent this season. They have a talented, well-coached team and they thought they could, if everything went perfectly, knock on the BCS door in their newly free state. They set up a schedule that would have people taking notice if they won. Unfortunately, they haven’t. After narrowly escaping Ole Miss they lost a tough one at Texas and then were humiliated at home by their hated rivals from Utah in the Holy War. It’s not even the end of September, yet but their season is essentially over. UCF didn’t come into the season with as many expectations, but after two dominating wins by a combined score of 92-3, including a 30-3 pasting of BCS conference member Boston College, they were getting a lot of buzz from national media as a team to watch. They are supposed to be the upstart team out of Florida making noise. Unfortunately, last week they ran into an even more upstart Florida team making even more noise when they lost to Mario Cristobal and Florida International. FIU isn’t a conference opponent, so it wasn’t a fatal blow, but the Knights certainly have to find a way to bounce back from that deflating effort before they lose again. UCF shares a distinction with just two other FBS teams -- the kind that you really don’t want to be a part of. They have not yet thrown a TD pass. In their case that shortcoming is just odd. They have passed for more than 200 yards per game, they complete a high percentage of their passes, their YPA is well above acceptable, and they have some decent talent at receiver. It would be very good to see them go to the house here just to get that monkey off their back. Part of the issue is play selection -- starting QB Jeff Godfrey leads the way with six rushing touchdowns, so they tend to run instead of pass in the red zone. The Knights have made it very hard for opposing teams to score touchdowns as well. They are tops in the country in passing yards allowed, second in yards allowed, and third in points allowed. 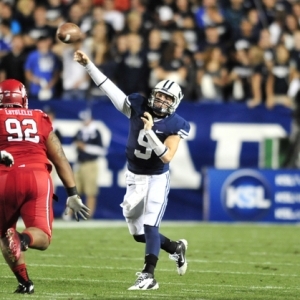 That staunch defense will be a big test for BYU QB Jake Heaps, and a big test isn’t what the sophomore needs right now. After an impressive freshman season last year Heaps has so far regressed this season. His completion percentage and YPA are down when you would have hoped to see them jump. He has just three touchdowns and four interceptions. He needs to be much better than he has been -- something that will be hard to do against this defense. The rushing game certainly won’t take pressure off him, either -- they are ranked just 118th in the country. The biggest concern for BYU has to be that we have seen this story before. Last year after a nice season-opening win against Washington they stumbled in their next game, then stumbled again. Before they could help themselves they had fallen into a funk, and had lost four in a row and five of six. If they can’t get their heads together and learn from the experience last year then it could be deja vu all over again. We have some interesting line movement here for college football odds.. The game opened with BYU favored by 3.5, and it has now fallen to three in most places. That’s notable because nearly 70 percent of all bets have been placed on BYU. You wouldn’t expect BYU’s price to get more attractive in the face of that kind of support, so clearly the smart money isn’t in love with the Cougars. The total has opened at 43 and hasn’t moved in early action. The Knights are 13-3 ATS in their last 16 road games. They have gone ‘under’ in six of their last eight as underdogs. BYU is 6-2 ATS in their last eight. They have gone ‘under’ in 11 of their last 16. The two programs are playing each other for the first time. I want to like the Cougars -- I have had a soft spot for the QB factory since watching Ty Detmer redefine the position back in his day -- but I really don’t here. I don’t trust their mental state, I really don’t trust their defense, and I don’t like how Jake Heaps is playing right now. After the terrible loss at home to Utah the fans aren’t going to be happy, and they will have a short fuse if things go badly early on. Central Florida has a dramatically better defense, and offense that is easier to trust despite the lack of passing touchdowns, and confidence that won’t be nearly as fragile as BYU’s despite their last frustrating loss. UCF is the better all-round team right now, and I look for them to win outright. I’d jump at +3.5 if it can still be found. The total seems sound, but given the defense of UCF and the struggles of BYU -- and the tendency of both teams to go ‘under’ recently -- I would lean to the ‘under’ here.